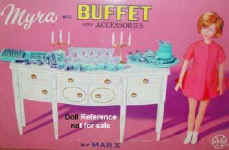 Barbie is the star of the Mattel line and had many clone dolls that competitors created to make a similar doll at a lesser cost. Her sister Skipper was also copied, though she is not as commonly found as her big sister, which only makes her more alluring as she only surfaces on occasion, hopefully this page will help you to identify them. 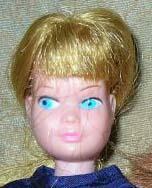 1964 Mattel Skipper doll, 9 1/4" tall, soft plastic head with long straight rooted hair with bangs, blue painted eyes, coral lips, hard plastic body jointed at the neck, shoulders and hips with straight non bending legs. Swimsuit is one piece red and white cotton. Doll mark Skipper © 1963 Mattel, Inc. 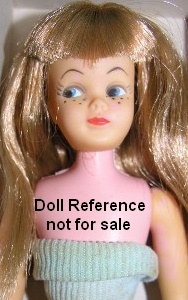 The Skipper doll was made by Mattel. 1964 Skipper doll, 9 1/4"
ca. 1960s Shillman Corky doll, 9 1/4" tall, looks like a Tammy's little sister doll Pepper by Ideal, made by M. & S. Shillman. ca. 1960s Corky, 9 1/4"
ca. 1960s - 1970s Eegee Lil Sister, 9 1/4" tall, soft plastic head with long straight rooted hair, with or without bangs, painted blue eyes, freckles across the bridge of her nose, closed painted mouth, jointed at the neck, shoulders and hips. Lil Sister actually looks more like Tammy's little sister the Pepper doll by Ideal. Wore a red and white swimsuit similar to Skipper. Doll marked EG, Eegee 100, made by the Eegee company. ca. 1960s-1970s Lil Sister, 9 1/4"
ca. 1960s Miss Gwen doll, 9 1/4" tall, by British Crown colony marked: Hong Kong. Has a very squishy soft vinyl head. Swimsuit colors may have varied, as a red with white swimsuit like the one shown on the box front has been found. ca. 1960s Miss Gwen doll, 9 1/4"
ca. 1960s Cragstan Miss Kitty doll, 9 1/4" tall, by Cragstan, looks just like Mattel's Skipper but has freckles on her face like her friend Skooter. Came wearing a red and white striped swimsuit similar to Skipper's but see for yourself. Miss Kitty is marked: Hong Kong. Photo is courtesy of Kathy Nolan, as well is the entire page, as she asked about Skipper clones, and we agreed, we need a page and the internet needs one too, lol. Thank you for asking & sharing your Skipper clones with us! ca. 1960s Miss Kitty doll, 9 1/4"
ca. 1960s Marx Myra doll, 9 1/4" tall, was the sister to Marlene, short rooted hair with bangs, painted facial features, all vinyl. ca. 1960s Myra doll, 9 1/4"
ca. 1960s-1970s Plasty Peggy doll, 9 1/4" tall, by Plasty a German manufacturer, had an extensive wardrobe. ca. 1960s Peggy doll, 9 1/4"
ca. 1960s-1970s Elite Sandy doll, 9 1/4" tall, made by Elite Creations, marked: Unique. ca. 1960s Sandy doll, 9 1/4"
ca. 1960s-1970s Skipper Clone doll, 9 1/4" tall, many of these dolls may not have markings to identify the manufacturer and often are made of a lighter weight plastic. She has long straight hair which is pulled back into a ponytail for this head shot. Doll maker is unknown. ca. 1960s Skipper Clone doll, 9 1/4"
ca. 1960s Eaton Dimples doll, 9 1/4" tall, sister to Babette, sold by Eaton of Canada. ca. 1960s Fab-Lu Mary Lou doll, 9 1/4" tall, Ideal Pepper clone or look a like, sister to Babs, made by Fab-Lu. ca. 1960s Princess Grace Doll Miss Pre-Teen, 9 1/4" tall, by Princess Grace Doll Company. Came dressed in the same swimsuit as the Miss Gwen doll, could be from the same company with new packaging.